Oh, friends. So much to catch you up on, once again, and no time to do it. I have been starting my days too early (more to come on this later) and burning the midnight oil working for the last few weeks/months straight, and I’m burnt out. BURNT. OUT. The end is in sight, but I’m still a few weeks from becoming a normal human being again; which in turn means that this blog is a few weeks from being regularly tended. But I’ll be back, yo. Soon. In the meantime we are back in a phase of early wake-ups thanks to a little 3.5 year old alarm clock who sometimes goes by the name “Owen”. I’ve been doing this parenting thing long enough to realize that everything is a phase (EVERYTHING), so I’m doing my best to just ride it out. But man, when I turn off my laptop at 11:30pm and then hear cries/the pitter patter of little feet/doors slamming/toilets flushing at 4:30am, it makes me a little bit cranky. And by a little bit cranky I mean a lot. Remember when we got the “OK to Wake” clock? And then we went through a phase when it had to be removed from his room because he was too anxious/excited about it turning green and it was actually causing him to wake up earlier? We made it through that phase after a while and the clock went back in his room. It worked beautifully until a few weeks ago when the same thing started happening. He nudged the “rules”. He began asking if he could wake up “a little earlier” to read books before his light turned green. Or he would get up at 5am to go pee and then hear cars outside and make the logical assumption that since other people were awake, that it was time to wake up. And his clock was about to turn green. And then his active little body could only sit still or “read books” for so long, and he was popping out of his bed, slamming doors, running down the hallway to peek under our door to see if our light was on, etc. For some reason, the clock has made him ask more questions than having no clock at all. And now that he has some understanding of time and how to tell time, NOT having the clock seems to leave him confused and anxious as well. Inevitably these early morning shenanigans have woken up Emmett, and despite our best efforts (demands) for everyone to stay in their room and quiet until “the light turns green” (we still have never given in to going downstairs before the clock turns green), we’re in a dark, dark place filled with 4am potty trips and crying and negotiations/deal-making. On one hand I wonder if he’s currently getting too much sleep. He goes to bed at 7:30pm and is almost always asleep by 7:45pm. He’s exhausted at this point and I really can’t see forcing him to stay up any later. He’s also still napping during the day (usually 2.5 hours, but recently I’ve cut it back to 2). Again, he’s usually exhausted midday and still crumbles to pieces if he misses his nap (and HELLO! I love and need those 2 hours of him napping as much as he needs them sleeping), so I can’t see doing away with it quite yet. In the past, MORE SLEEP has always beget MORE SLEEP for him. So I hesitate to change his schedule and take away sleep if what he really needs is more sleep. With Owen, more sleep has pretty much always been the cure for… everything. But it certainly seems like his body is ready to get up for the day at 5:00am on average. And that’s just a wee bit too early for me. On the other hand, I wonder if some of these issues are stemming from a yearning to understand time and how to tell it. I wonder if giving him more information about time will help, or hurt. I really don’t know, and I don’t know what a 3.5 year old can really grasp or understand. It’s a good thing he’s so darn CUTE. 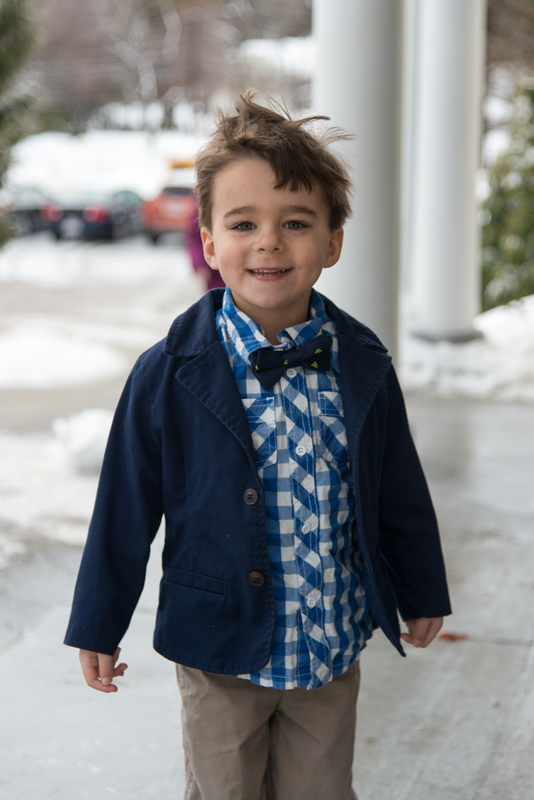 That’s his outfit for “Fancy Day” (his school’s alternative to Valentine’s Day) that he chose all by himself. No, he wouldn’t let us iron his pants. I’m sure the sleep thing will pass, and one day when he’s a teenager and I can’t, for the life of me, wake him up to get him to school, I’m sure I will look back on this and laugh. Given the millions of other things that are battling for my attention right now, I am trying not to waste too much brain space on stressing about an issue that I have very little control over. But seriously? I would like some SLEEP. We made a potentially very bad parenting decision last night. And it nearly broke our hearts. As I’ve mentioned before, Owen LOVES his lovey. Lovey stays in bed (my hard and fast rule to avoid dragging him around everywhere we go) and is only available at nap and bedtimes, but oh how he is loved. We have three identical Loveys that are rotated between laundry, home and school so that in the almost 3 years of his life, Owen has never had to sleep without one since they were introduced. As I also may have mentioned, Owen has taken to sucking on Lovey’s foot (arm?) while putting himself to sleep. It’s kind of gross, as that particular foot (on all three Loveys) is brownish, despite a billion washings, and starts to stink a little after a few sleeps. Then it’s time for a bath. 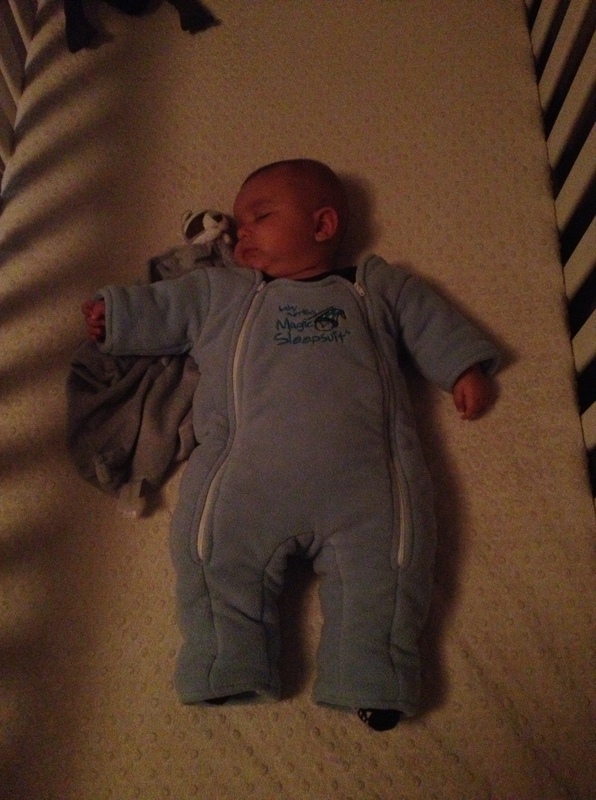 But hey, probably no worse than a pacifier or a thumb, and at least this one goes in the closet as soon as he wakes up. The sucking has been happening for a long time, but a more recent habit is hanging Lovey on his bottom teeth, dangling out of Owen’s mouth from his looped tag. I think this started when Owen’s little fingers got too big to fit inside the looped tag. I HATE this habit. Even more than the sucking. He tugs on Lovey while attached to his tooth just hard enough that I worry about his teeth growing in the wrong direction. Or one pulling all the way out. It’s probably unfounded, but for some reason this tag hanging thing just irks me. And frankly I just don’t like the way Lovey looks dangling out of Owen’s mouth. I’ve asked him not to do it, but of course there’s no way to regulate since he does it in the privacy of his own room when he’s sleeping. So Benjamin and I had the brilliant horribly awful idea to snip the tag open so that he couldn’t hang it on his tooth anymore. Last night we made the snip on the 1st Lovey. It took Owen about 1 second to find the atrocious offense before the tears began. I don’t WANT this Lovey. He’s broken! What happened to his tag? I can’t scratch it! I want to be able to scratch it. It doesn’t feel right. I want a different one. Granted, last night was a particularly tearful and easily-frustrated night for Owen, so maybe not the best timing. But is there really a right time to mutilate one’s best friend? Benjamin and I tried to keep blank faces but we were both crying on the inside. What had we done? I very nearly jumped in to say that I would buy him new ones… but I restrained myself because I wanted to see how this played out. We all read a book together and by the end Owen was sucking happily on his favorite Lovey foot, flicking the tag mindlessly just like he used to. Before I tucked him in I asked, “Are you ok?” “Yeah.” “Is Lovey ok?” “Yeah. I can just touch the tag like this. It’s good.”. Phew. I think we’re all going to survive. The moral of the story? I SO wish we had prepared him for the snip. Every time I try to “trick” Owen I end up feeling like it was the wrong decision. Maybe snipping it at all was the wrong decision, but it’s too late now. We’ve decided we’re going to snip the other 2 as they are introduced over the next few days (one is currently at school in his nap bag and I don’t want to “trick” him again and have him freak out at school), because I don’t think we can have one damaged and 2 intact. And I still don’t want him looping that tag around his tooth. And given that he got over the damaged goods pretty quickly, I think we’ll all move right past it. Lovey seems to be my Achilles heel with Owen. I just can’t stand coming between them. I’ll let him go to college with the darn thing if he wants. As long as he’s not pulling out his teeth with it. Owen’s favorite phrase du jour is “I have one more question for you”. It definitely sounds like something I’d say, so I’m not surprised he picked it up, but I am surprised that he seems to use it appropriately (when he really does have only one more question). It sounds so adult coming out of his tiny little mouth. We had our first “getting out of bed” experience the other night, 3 weeks after introducing the big boy bed (which also means that we won a bet with our friends, who said they’d take us all out for ice cream if Owen lasted 3 weeks without leaving his room — score!). I was wondering when that was going to happen! This was pretty much the best case scenario and I’m thrilled that Owen seems to have adjusted with very little changing in terms of our sleeping routine. So far, at least. This was the conversation we had when he woke up yesterday morning. Owen: Mommy, am I allowed to get out of bed? Me: No, you should stay in bed until I come get you in the morning. Owen: Is Lovey allowed to jump out of bed? Me: Well, it’s better if he stays in bed, but… Why? did he fall out of bed last night? Me: That’s ok! What did you do? Owen: Silence. I think he thought he was supposed to say he DIDN’T get out of bed, but doesn’t yet know how to lie. Me: That’s ok if you got out just to get Lovey. Because I didn’t hear you cry for me. Did you cry for me? Owen: No. I got out of bed (sheepish grin). Me: That’s ok. As long as it was just to get Lovey. Did you get right back in bed? Me: That’s awesome, buddy. I’m so proud of you for getting Lovey yourself. Owen: Mommy, I have one more question for you. Owen: Am I allowed to fix my blankets myself? Me: Yes. Definitely. Did you fix your blankets yourself when you got back in bed? So proud. As I’ve said before, we’ll see how long it lasts, but so far so good on the big boy bed front! THANK YOU all so much for your thoughtful comments on the big boy bed/new clock issue. It is so helpful to hear what worked for you and your families, as it helps drive home the point that everyone does this differently, and what works for one kid won’t necessarily work for another. As with potty training (and breastfeeding, and so many other things…), I decided to put my own “best laid plans” in the backseat and let Owen drive the bus. I asked him, point blank, if he wanted me to take the clock out of his room, and he said, definitively, “Yes. Take it out.”. I’m still not totally sure what the issue was (excitement about something new in his room, anxiousness about when the light would turn green, stress that he was awake before he was supposed to be, whatever), but it doesn’t really matter. Since we took it out 2 nights ago, he went immediately back to sleeping later and staying quiet in his bed until I come in to get him. Phew. Crisis averted. We’re going to keep the clock in our back pocket as a tool if getting out of bed becomes an issue, but there’s no way to tell now if it will be necessary. Though I’m still on the “move to a big boy bed in the next month or two, or wait until several months after the baby comes” fence, I think we’re going to give it a shot sooner rather than later. 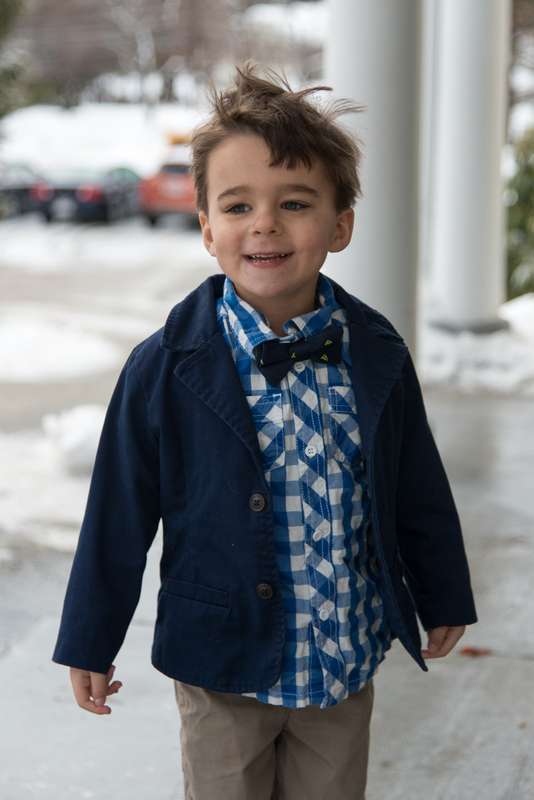 Owen seems to know exactly what he’s ready for and what he wants, and he is verbal enough to tell me exactly what’s not working for him, so I’m going to trust that he can help lead me through this next transition. More to come on that! Also, thank you to those sending me good vibes while waiting for my Fifth Disease test to come back. It took a really long time (3 days in the lab, when I’m used to results within a few hours), but finally came back showing that I am immune to Fifth, which means I’ve had the infection at some point in the past and it is no longer a risk for me or my baby. So, “lights out” on another thing I had been worried about. Hooray for being the weird rash-y kid (much like my son) who got All The Sicknesses as a little tyke. Though it was never diagnosed as such, I have had it before. 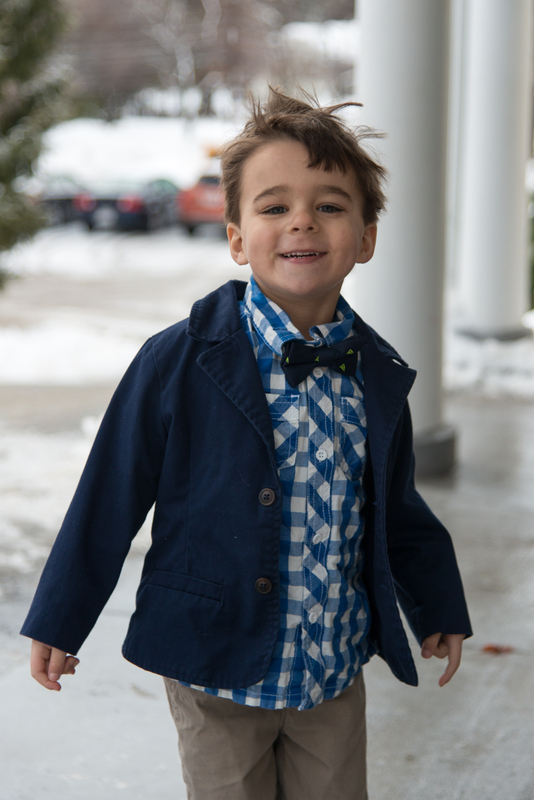 My antibodies are strong now, and I can only hope for the same for Owen when he grows up. Here’s to a happy, HEALTHY long weekend! Owen has been hitting a lot of milestones recently that I really didn’t think we’d be facing until closer to age 3. Potty training is the big one, but also asking really mature “Why?” questions and understanding nuances that I really though would go over his head until he was older and wiser. Recently as we played at a friend’s house, Owen became enamored with his friend’s “big boy bed” and began begging for one of his own. I’m aware this is super cliche. But, waaaaaah! I know it’s just about time. Heck, some people switch to the big boy bed by 18 months, and here we are at 2 1/2 still in a crib. But I LOVE the crib. OWEN loves the crib. It’s safe and it’s contained and he knows the “rules” and he sleeps like a champ. I haven’t wanted to rock the boat up until now, and I still don’t. I didn’t realize that I’d feel so emotionally about Owen and his crib, but I do. While Owen may be almost ready for this big switch, I think I’m the one who is not. Anyway, my own my-baby-is-growing-up issues aside, not to mention I’m-scared-he’s-going-to-get-out-of-bed-all-the-time-and-we’ll-never-sleep-again, we’re working on taking baby steps towards this goal. Step 1: Get the OK to Wake clock. I’ve seen several different versions of this clock around the internet, and I think they are genius. Essentially it’s a clock that changes color at a certain time to let your kid know he/she can get out of bed, or wake up from nap, or make noise. Since they can’t tell time yet. My thought process was to institute the clock and lay the ground rules first (since he’s still in a crib, for instance, we’re working on being quiet until the clock turns green, then he can say “Mommy!” and I’ll come in and get him in the morning). I told myself that once he knew the rules, he’d be more likely to follow them (“you have to stay in your bed until the light turns green in the morning”) when he got his big boy bed. Well, it hasn’t exactly worked out as I planned. For some reason, introducing this clock has caused nothing but problems. The first night I told him the night light would stay on all night (because I thought it would), and the yellow light would turn to green when I would come get him in the morning. Except the night light part went out at some point during the night, and he woke up at 4am screaming because his room was too dark and the nightlight had disappeared. Sad. The next night I left his regular night light on, and figured out that even without the night light on, the light would turn green in the morning when he could wake up. So Owen was up at 5:30am crying, “The light is not green, Mommy. ::Sniff, sob:: It’s NOT GREEN!”. Prior to this, he was staying quiet in his room until 6:40am almost every morning. Harumph. We did a lot of talking during the daytime about what the clock would and would not do, and how I wasn’t going to come in his room until it turned green in the morning. The next night he was up at 5:00am again, this time wailing about his blanket falling off. Recently he’s been getting really confused by night time sleep and daytime sleep (he’ll wake up at naptime begging for a vitamin and his milk, which he gets in the morning, and then gets really upset when I tell him it’s the afternoon). We have only been using the clock at night time, since I usually have to wake him up from naptime, but he seems really confused by the different routine for night/nap. The clock does have a nap timer, so first order of business is figuring out how it works. Now, here’s the deal. I don’t know for a fact that these issues are related to the clock. Owen is dealing with some extra congestion and is definitely fighting some sort of bug, so I get that he’s not feeling well. We seem to have solved the blanket issue by giving him a bigger comforter (he was using a tiny infant blanket that he loved and didn’t want to give up, but it was getting really really small). But still, this morning, more crying right before the clock turned green. I want to just take the stupid clock away and go back to our blissful sleeping patterns. But I honestly don’t know if this is illness/teething-related, or truly a result of adding the clock. And, in theory, this clock thing could be a really useful tool as we think about getting a big boy bed. Anyone else use one of these clocks? Did it cause disruption to the routine when you introduced it? Am I missing something about how to explain how it works to Owen? Is this even a useful thing for his big boy bed transition, or should I just scrap the clock and see if getting out of the big boy bed is even an issue? Waking Owen up in the morning is one of my favorite parts of the day with him. Despite the fact that I usually wake up to his little voice tearfully whining “Mommy?“, he’s always laying down with his eyes closed (and nowhere near as emotionally distraught as his voice made him seem — little drama queen) when I come in his room. I turn the lights on just a little so it’s still dim, talk softly and turn off his sound machine. He smiles and rolls around in his bed and starts babbling immediately while his brain wakes up the rest of his body as I open the windows and let the sunshine in. “It’s a ‘chool day. Mommy goin’ to work? Wanna watch tv. Look at lovey, all tucked in. I put lovey in my mouf at ‘chool (apparently his new classroom tries to tell him not to put his lovey in his mouth at naptime… not really sure why, but he’s been talking about it a lot). No change my diaper, Mommy. Where’s my doggie? I wanna pat him!” We talk about the weather and what we’re going to do and what clothes he will wear. We look out the window and talk about the cars and trucks and birds. We play peekaboo and toss his lovey in and out of the crib, which he finds hilarious. On the weekends, he would happily roll around in bed and talk for a good 20 minutes before actually getting up. On school days I have to think of different things to get him excited about to get him out of his crib without a fight. As of about a week ago, he has a new favorite reason to get out of bed in the morning. Yes, you read that right. His vitamin. He has always asked me lots of questions about what I’m eating and drinking. I take a vitamin every day, and he watches me closely. Being the little actor that he is, he used to stand next to me and mimic my movements, pretending to take a sip of water, put the pill in his mouth, take another swig and tip his head back to swallow. I never realized my vitamin-taking routine until he copied it. Until recently, I hadn’t given Owen a vitamin of his own. We tried Poly-Vi-Sol when he was a baby, but after the barfing/not pooping incident, I threw that vile stuff away and never looked back. When we were breastfeeding I gave him Vitamin D drops, but since he started eating a well-rounded diet I haven’t really seen the need for a supplement. Nothing really changed in my vitamin philosophy, except that I figure a little boost of vitamins can’t hurt (especially as we head into cold & flu season and a new school year), and now he’s old enough to chew one of the vitamins that taste like candy. And what kid wouldn’t like that? Now he’s obsessed with taking it every morning “just like Mommy”. All it takes to get him jumping out of bed is, “What color do you think your vitamin will be?”. Unfortunately I doubt this technique will still work when he’s 16 and doesn’t want to wake up.